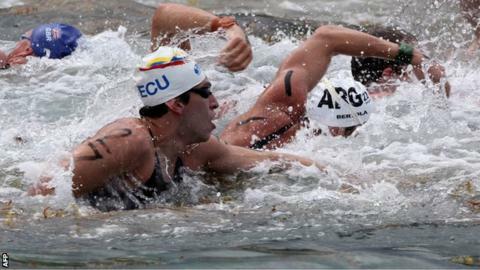 The Loughborough swimmer beat Ecuador's Esteban Salgado and Italy's Simone Ruffini to win the 10k open water race in one hour 42 minutes and six seconds. Britons Dan Fogg, Caleb Hughes and Tom Allen were seventh, 19th and 23rd in a 70-strong field. Britain's former world champion Keri-Anne Payne finished 19th in the women's race, won by Haley Anderson of the United States. The event was the final stage of qualification for this summer's World Championships in Kazan with the British team to be announced at a later date. League One finale - who will go up or down? Read more on League One finale - who will go up or down?